This meeting has been postponed due to the weather. We will post the new date as soon as we have set it up. About: Guest speaker will be DJ Rhodes from The Insurance Center. 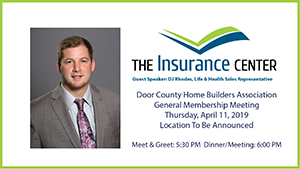 He will discuss the new health insurance programs available to our members via the Wisconsin Builders Association. Meal will be an All-American Buffet which includes Chicken Marsala, Roast Beef (Pre-Sliced) with Bordelaise Sauce, Tossed Salad, Vegetable Medley, Garlic Mashed Baby Red Potatoes, Chilled Pasta Salad, Fruit Salad, Rolls. Meet & Greet;:5:30 p.m. Dinner/Meeting: 6 p.m. Member receives one complimentary meal. Additional guests should make meal payments to Jeff Dorner.